Trump administration energy policies are stifling the U.S. and worldwide effort to stem rising greenhouse gas emissions and warming mean annual temperatures. The U.S. would not have met the emissions reductions pledged to as per the terms of the United Nations Framework Convention on Climate Change (UNFCCC) Paris Climate Agreement, even with the institution of the Clean Power Act, according to a study from the World Resources Institute (WRI). The U.S. will fall further behind given the Trump administration’s efforts to undo the climate and “green” energy policies, programs and other actions taken by the Obama administration and replace with them with new ones that support more fossil fuel exploration, production and use. President Trump recently repeated his intention to withdraw the U.S. from the UN Paris Climate Agreement. Key cabinet officials – Energy Secretary Rick Perry and EPA Administrator Scott Pruitt – proceed to implement plans to boost fossil fuels at the expense of key public health, safety, and environmental regulations. That includes taking out the Clean Power Plan, which would have imposed stricter limits on emissions from power plants, the largest source of emissions in the nation. All hope is not lost, however, WRI points out. “[M]any states, cities and companies have stepped up in response to Trump’s announcement on the Paris Agreement with their own statements of ‘We Are Still In,’ pledging to support the agreement and to take action on climate change,” WRI’s Taryn Fransen and Kelly Levin write in a Dec. 6 blog post. America’s Pledge documents the commitment of individual government actors at the state and local levels, Fransen and Levin highlight. Many states and cities number among them, as documented in their own words upon joining “We Are Still In,” a reference to the UN Paris Climate Agreement. “[M]ore than 2,500 non-federal actors, representing more than half of the U.S. economy, have pledged support for the Paris Agreement goals. The report was released by Gov. 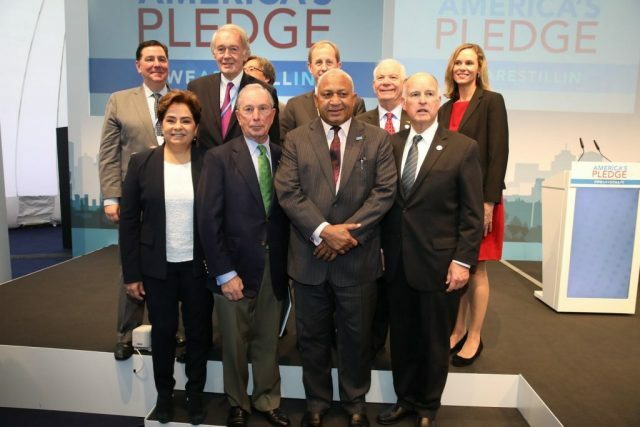 Jerry Brown of California and UN Special Envoy on Climate and Cities Mike Bloomberg, with analysis by our colleagues at WRI, the Rocky Mountain Institute and CDP,” they write. Globally, every UN member nation has now signed and is proceeding to ratify, or has already ratified, the UN Paris Climate Agreement, even Syria. That singles out and isolates the U.S. internationally as the only UN member nation who has decided not to participate, the point out. Speaking at the most recent G20 Summit, President Donald Trump said the U.S. “would immediately cease implementation” of its Nationally Determined Contribution (NDC) to reducing greenhouse gas emissions as per the terms of the UN Paris Climate Agreement. Increasing oil and gas production on public lands. WRI analyzed seven independent studies regarding the trajectory U.S. greenhouse gas emissions would likely take out to 2025 in light of Pres. 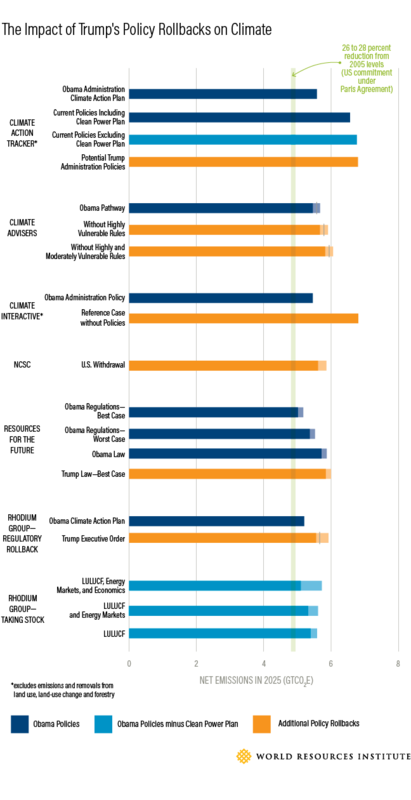 Trump’s energy and environmental policies, and comparing them with forecast levels had Pres. Obama’s climate and energy agenda been implemented. U.S. greenhouse gas emissions in 2025 will range from 5.8 to 6.8 gigatons CO2-equivalent given Trump’s policies go into effect. They would have ranged from 5.1 to 6.8 Gt CO2e under Obama’s policies, according to WRI. U.S. greenhouse gas emissions totaled 5.8 Gt CO2e in 2015. The U.S. would fail to meet its UN Paris Climate Agreement emissions reduction targets either way, WRI highlights. “Additional actions would have been necessary between now and 2025 to achieve the U.S. NDC even if the full suite of Obama’s policies had been enacted,” Fransen and Levin note. Average mean global temperature would be 0.3 degrees Celsius (0.5 degrees Fahrenheit) lower in 2025 were the U.S. to achieve the NDC targets pledged to by Pres. Obama upon signing the UN Paris Climate Agreement, according to an analysis by Climate Interactive. That does not take mechanisms to scale up emissions reductions over time incorporated in the agreement, which seeks to cap global greenhouse gas emissions at a level intended to limit mean annual global temperature rise from 1.5-2 degrees Celsius (2.7-3.6 degrees Fahrenheit), Fransen and Levin highlight. “The Trump administration’s actions to reverse actions to reduce GHG emissions isolates the United States and will likely slow this country’s progress on tackling climate change and advancing clean energy. 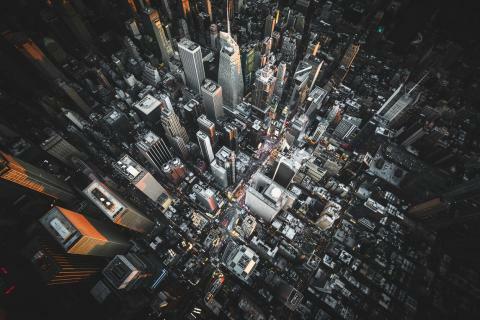 “How much emissions and global temperatures will rise as a result has yet to be fully determined, and will depend in large measure how subnational action in the United States, such as the We Are Still In campaign, market forces, and international efforts can sustain momentum in the coming years,” they elaborate.